If you do not have the proper balance of chemical levels in your hot tub, you'll never have a clean hot tub. Keeping the chemical levels of your hot tub in check will make it easier on you when it comes time to clean your hot tub - so invest in an inexpensive water testing kit from your local pool supply store or home center.Cleaning your hot tub means buying the appropriate chemcials. The type of chemicals that you will need will depend on the levels of chemicals already in your hot tub. The various types of scum that are found in hot tub water is best diagnosed by testing with the kit mentioned above, or by taking a sample of the hot tub water to your local pool supply store so that they can diagnose the water's problems and point you to the right chemicals for your particular situation. Chemicals on hand, now is the time to get down to work. Drain your hot tub according to the manufacturer's instruction that came with the hot tub when you purchased it. Use a soft sponge or scrubber to apply the chemicals that you have purchased. Choose a scrubber that is non-abrasive, especially if your hot tub is made from fiberglass. Test for abrasiveness by scratching lightly in an unseen spot before using. Scrub the hot tub using the chemical. Be certain to wear rubber gloves and eye protection, and to avoid contact with any mucous membranes. Keep chemicals used to clean hot tubs out of reach of children. Rinse the hot tub with clean water. Refill your hot tub. Replace or clean your hot tub's filter. Maintaining a pleasant hot tub cannot be achieved if the filter is not cleaned as well. Always turn off all filters and pumps before you deal with your hot tub's filter to avoid personal injury. For hot tubs with wooden exteriors, keep your hot tub looking like new by applying a good wood sealant and wax annually to the exterior wood. There is an alternative, chemical free way to clean your hot tub that costs just pennies. Mix a solution of ½ part water and ½ part vinegar into a spray bottle. Spray the vinegar and water solution in liberal amounts over the hot tub. * Caution: although most hot tubs are made of fiberglass and can withstand the mild acidic action of vinegar, this is not advisble for porcelain surfaces as they can become damaged. Wait fifteen minutes to give the solution time to eat away any hard water stains or lime scale that may have built up on the hot tub. For stubborn stains, spray more solution and wait an additional fifteen minutes. Repeat this process until your hot tub is sparkling clean. For really hard to remove stains, you can make a pasty solution of white vinegar and baking soda and apply with a soft sponge whiel scrubbing gently. Never use steel wool or abrasive pads on your hot tub. Wipe the solution and any remaining residue away with a damp cloth. 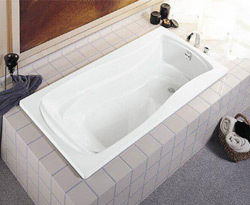 Check Out our Full Selectin of Whirlpool Baths Today!